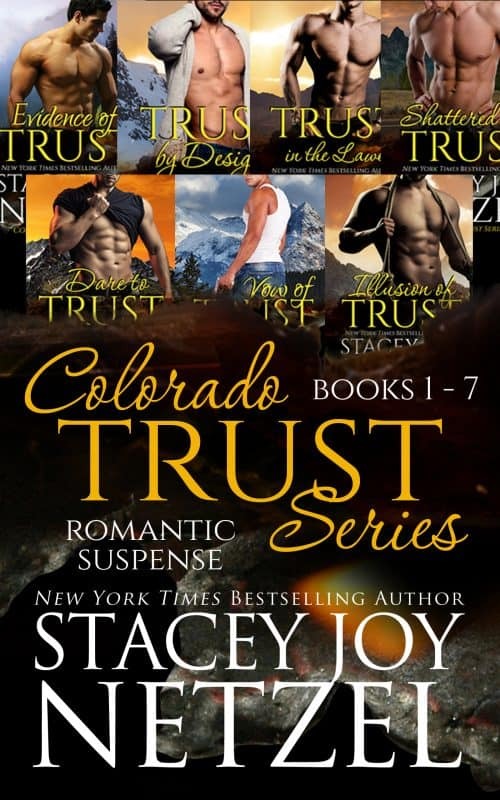 Trust makes all the difference when love and danger collide. Includes All 7 FULL LENGTH books in one convenient set! All 7 FULL LENGTH books in one convenient set. Buy the complete series and save $10 off the individual books! Sparks fly when a headstrong wrangler and an alpha park ranger are thrown together while he searches for evidence to stop the poacher killing animals in RMNP. When the monster turns his sights on Brittany, Joel will do whatever it takes to protect her—even give his own life. Cinderella and Prince Charming…brought together by chance, or design? Keep your friends close and your enemies closer—that’s why Dean hires his rival’s ex-girlfriend, interior decorator Gina Allen. He didn’t count on his heart being in more danger than his business or an unexpected betrayal that threatens their lives. Kendra has three brothers: Eight-year old Noah she’s determined to protect, Joel has no clue she exists, and Robert wants her dead. She and Noah flee New York for Joel’s Colorado ranch, but his ranch manager suspects the long-lost sister’s secrets could endanger his boss’s family. As friendship and attraction grow, Kendra must decide if she can trust Colton with the truth before Robert tracks them down. A new co-owner of Hunter Construction, Justin Blake goes undercover to discover the truth behind his grandfather’s death. He isn’t prepared for an instant attraction to Marley Wade, the general contractor on site, or the buried secrets linking their families that threaten to shatter their future and his entire family. Hollywood wild child Lexie Sinclair disappeared by joining the army and marrying a soldier. Then her alcoholic husband wrapped their car around a tree, leaving her widowed and permanently injured. Ad-exec Jordan Blake believed image was everything—until family scandal escalates his drinking and fuels the tabloids. His arrival at the resort where Lexie now lives exposes her location, drawing out those who will stop at nothing to learn her dead husband’s secrets. Shadows of the past leave her afraid to trust and puts both their lives on the line. Cassie Blake turned her back on her brothers in the middle of a family scandal, but before she can return to Colorado and make things right, she must pay her debt to a scheming Sin City loan shark who’s decided he wants her instead of the money. A desperate gamble to get her life back on track takes an unexpected turn when she runs into a familiar face from home. Not everything that happens in Vegas stays in Vegas. A woman on the run with a billion-dollar secret that could save her father must trust a stranger who doesn’t believe in risking anything for family—especially not your life. "Every one of the books in this boxed set were wonderful. Also, each was different enough that you will not get tired of them. Ms. Netzel is one of my favorite authors - pretty much an automatic buy!" "So glad I had the whole series as a set. Love her writing and the characters she builds. They're people you'd like to meet. I'm hooked on everything she's written."